‘National Youth Day’ was celebrated at the local M. M. Modi College by organising a Special Lecture on the importance of ‘National Youth Day’. Sh. Chander Shekhar Talwar, a retired IAS Officer and Indian Red Cross Society, Punjab, Chandigarh delved deep on the given topic among an impressive gathering of about 300 students and teachers. He said that this day is an occasion to expose the problems and potentialities of the youth. He further informed that Pt. Jawahar Lal Nehru declared the birthday of Swami Vivekananda as the ‘National Youth Day’ in Jan. 1963. He cautioned the students to not to be influenced by religious fanaticism and fundamentalism. Dr. Khushvinder Kumar, Principal of the College welcomed the learned speaker and shared many incidents from the life of Swami Vivekananda. He also thanked NSS Programme Officers – Dr. Rajeev Sharma, Mrs. Jagdeep Kaur and Prof. Harmohan Sharma for their efforts in organising such programmes. Prof. Harmohan Sharma also spoke on Swami Vivekananda’s Teachings. 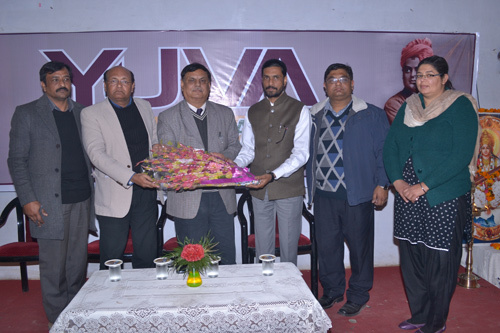 Dr. Rajeev Sharma and Ms. Ribha Singla conducted the stage.